Why do the Grammy Awards matter? Well even if you don’t win anything, the exposure as a performer is just about priceless for those that get the opportunity. 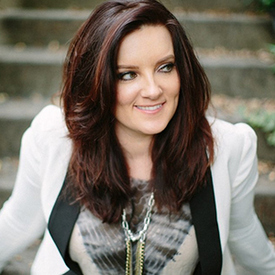 Brandy Clark was up for Best Country Album for her 12 Stories release, and Best New Artist at the 57th Grammy Awards, and walked away with neither. But her performance with Dwight Yoakam on her song “Hold My Hand” landed Brandy the largest single percentage gain in song sales amongst all performers on the night, and also saw her album get one of the biggest boosts. After the intimate, acoustic Brandy/Dwight version of “Hold My Hand,” sales spiked a ridiculous 23,871%. Yes, that’s a comma, not a decimal point. Of course it helped that sales for the album track were negligible to begin with, but with the help of the Grammy Awards, she sold and additional 5,000+ downloads. Coming in second amongst performed songs was Beck’s “Heart Is A Drum.” It sold an additional 3,000 downloads for a percentage spike of 2,995%. Brandy’s 12 Stories ended up 3rd on the list of biggest-gaining albums post Grammy bump in percentage. The album moved an additional 2,000 units for a 275% gain. The biggest gainer was Beck’s Best Album winner Morning Phase, which saw an increase of 10,000 units sold for a 945% spike. Brandy Clark and Dwight Yoakam performed “Hold My Hand” right after Eric Church took his turn on the Grammy stage—only appropriate because Brandy and Dwight bonded with each other while opening for Church on “The Outsiders” tour in 2014. JUdging from the percentage spikes, the case can be made that Brandy Clark and Dwight Yoakam’s “Hold My Hand” performance was the most impactful music moment of the night. Also, sturgill hit 100,000 sales this week, so congrats to him! back up today (12th) for the time being. The other thing that these performances do is they really lay the groundwork for the next record. It’s true with Brandy Clark and with Sturgill and now that they both have major label backing and the resulting PR push they will have a shot at really breaking out with big numbers. In fact I wouldn’t be surprised if timed right to avoid a big release that Sturgill has a shot at a #1 country album. The story at this point would be if Sturgill was NOT #1 or #2 upon debut. Yep. An amazing example of career building. Hasn’t been seen like this in the country genre in a long time. Maybe 2015 will be the Year of Brandy Clark, just like 2014 was the Year of Sturgill Simpson. I would “like” this comment multiple times if I could. I’m wondering if she might be able to benefit somewhat from Sturgill’s success. Same producer and I think she would appeal to a lot of his fans. Maybe open for him at some point? I’ve only seen her live once when she was touring on Tin Star and I thought she was just great. I wonder what kind of spike Rosanne might have enjoyed. Also Campbell. Both are highly deserving! Unfortunately because they didn’t perform and there awards were given away pre-telecast, I’m not sure it resulted in any significant new sales. I’m sure it gave them a slight bump, but the performance slots are really what drives mass interest. 12 stories is a songwriter’s album and this song is a gem .The whole record is inspiring as hell and performed by a terrific writer /vocalist in Brandy Clark . You can’t not like her or her songs if you are a real music lover. This not-so-small victory just supports the case that there is a market for the ‘good stuff ‘ if the good stuff could just get a little more love thrown its way in terms of promotion and exposure by the media , radio , labels and entertainment outlets . That is a really nice tune, and performance, including the way they played their guitars. Is Dwight Yoakum seeing a similar surge after the Grammys? The only thing that I found disappointing in the performance of “Hold My Hand” was the lack of steel guitar. In the recorded version of the song, introduction of a piercing steel sound in the last chorus contributes strongly to a climactic feeling. I get chills every time I hear that part. Earth to country radio, women with great country music outsell many men when people are allowed to hear them! This was a great performance. My favorite from the Grammys was Annie Lennox’s chilling “I Put a Spell on You,” but this is a close second.